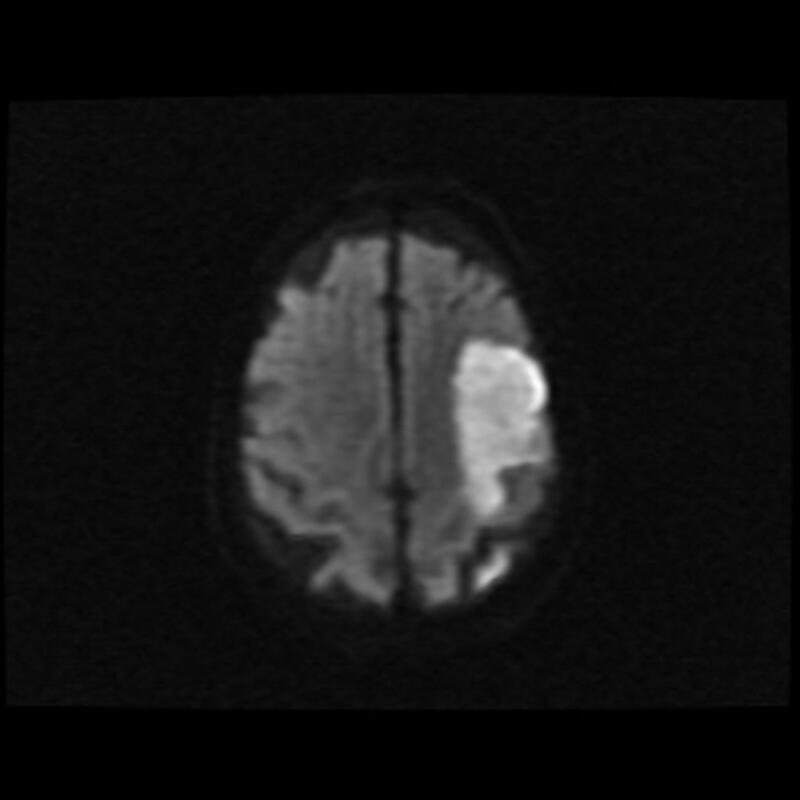 Diffusion weighted imaging (DWI) is a sequence used in MRI studies to gain additional information about the anatomy based on the diffusion of water molecules. Understanding the physics of is important to help understand its applications, especially in neuroradiology and body imaging. Molecular diffusion, including of water, in tissues is not free but involves interactions with many other substances. It also depends on the temperature and chemical properties of adjacent materials. This is associated with Brownian motion, which is the random movement of particles in a fluid as they interact with each other. DWI assumes that a molecule of water is free to diffuse or move in any direction, known as isotropic diffusion. To assess motion, the homogeneity of the field is varied linearly by a pulsed field gradient. Molecules that move more freely in between pulses lose signal more rapidly. In reality, the motion of the molecule is affected by several factors, including the strength of the gradient pulse, the duration, the field strength, and more. To simplify the coefficients of the diffusion, these values were combined into a single scalar known as a b factor and multiplied by the attributed diffusion coefficient (ADC), to account for the additional interactions in biological tissues. The aforementioned process generates four sets of images: a T2* b=0 image and three diffusion-weighted images (one for each X, Y and Z direction) with the T2* signal attenuated according to how easily water can diffuse in that direction. These images can then be combined arithmetically to generate maps that are devoid of directional information (isotropic): isotropic diffusion-weighted images (what we usually refer to as DWI) and ADC maps. To generate the isotropic DWI maps, the geometric mean of the direction-specific images is calculated. The ADC map, in contrast, is related to the natural logarithm (ln) of the isotropic DWI divided by the initial T2* signal (b=0). These can either be calculated directly from the isotropic DWI images or by finding the arithmetic mean of ADC values generated from each directional diffusion map. In neuroradiology, the main use for DWI is to assess for acute ischemia. Increased signal is seen in ischemic tissue a few minutes after arterial occlusion, as extracellular water moves into the intracellular space, which "restricts" its motion causing cytotoxic edema. The ADC value decreases, bottoming out about 1-4 days after the acute insult. Over time, the ADC normalizes first. DWI may remain bright due to T2 shine through from edema in the surrounding tissues. Over time, the DWI normalizes as well. In body imaging, DWI can be useful for assessing malignant disease. By evaluating the relative attenuation of signal intensity from lower (b=0) to higher b values, tissue characterization becomes possible. As Koh et al note in AJR, the more cystic or necrotic portion of a tumor will show greater signal attenuation at higher b values because water diffusion is less restricted. The more cellular components will continues to show high signal. From Koh and Collins, AJR:188, June 2007. However, care has to be taken not mistake intrinsic high T2 signal for restricted diffusion (ie "T2 shinethrough"). As an example, a gallbladder will remain bright on DWI because of this effect. Non-malignant lesions can also show increased signal, such as hemangioma, but this will be bright on T2 as well. This post is derived from notes I took during training. Any images are copyright their respective owners.